By interpreting what a medical record expects, this voice tool enhances speech recognition applications. Intelligent language processing (ILP) is still a novelty for the majority of medical transcriptionists and HIM professionals, but those fortunate enough to have the software for this speech recognition enhancement tool wouldn’t have it any other way. According to some experts, ILP is a solution whose time has not yet arrived, but it promises to be a significant player in the near future. 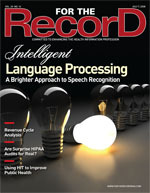 The technology is generally used to cover any activity that utilizes language structure and semantics to facilitate task completion, according to George Zavaliagkos, PhD, head of speech recognition and natural language processing at eScription, a software vendor recently acquired by Nuance Communications, Inc, within the Dictaphone healthcare division. “For speech recognition, intelligent language processing is the collection of technologies that takes a stream of words produced by speech recognition and ‘interprets’ it to what is expected in a medical record. Hence, we have the term interpretive model, which provides the appropriate formatting,” explains Zavaliagkos. VITAL SIGNS: Blood pressure is 124/82, pulse is 76, weight is 142 pounds. GENERAL: She is a healthy-appearing white female, no acute distress, alert and oriented x3. David Owen, product line marketing manager at 3M Health Information Systems, compares ILP’s potential with a computer mouse, which provided users with a new way to interact with computers back in the 1980s. Similarly, ILP’s voice tools are like a user interface for speech recognition because they enhance its application. “We now have an opportunity to have a document transcribed in a shorter period of time than ever before,” he says. Because the healthcare industry relies so heavily on documentation, getting a handle on paperwork has always been a concern, says Michael Mardini, vice president of medical imaging for Nuance’s Dictaphone healthcare division. However, the ultimate reason for using ILP, he says, is the number of uses for the data it holds. The data can not only be used for a more efficient method of documenting patient care—they can also be used for research, as well as for tracking a patient’s clinical records and care over time, notes Mardini. ILP can reduce dictation time and guide a clinician’s care protocol by organizing information into appropriate templates, thus keeping protocols consistent from doctor to doctor. With the industry’s emphasis on shorter turnaround time (TAT) requirements, ILP’s ability to increase transcription productivity can be invaluable. In addition, the technology also helps to better substantiate billing codes, which now require increasing amounts of documentation. One health system has realized tremendous benefits by incorporating ILP into its day-to-day operations. “ILP was a way for us to gain productivity and eliminate outsourcing. We also knew that ILP is the way of the future,” says Darla Foltz, director of transcription services at Mount Carmel Health System in Columbus, Ohio. The second-largest healthcare system in central Ohio has utilized ILP software since 2005, enabling Foltz’s staff to increase productivity by 92%, eliminate outsourcing, and increase department capacity. All TATs are compliant, most notably those in radiology, where there is an average 18-minute report time. Mount Carmel’s revenue-generating transcription services department boasts 54 clients, an atypical number that keeps staff busy and secure in the knowledge that their positions aren’t about to be eliminated. “Eighty-eight percent of our time now is spent editing instead of transcribing,” Foltz says, adding that other staff are also pleased with the technology and the quicker report times have been a boon to physicians. Speech recognition software alone does not typically format with headings and sections, but ILP can add these functions because it recognizes text and can provide greater clinical relevance to data. “We are moving from speech recognition to applying ILP tools that help format documents and recognize more about the clinical relevance of documents, so we can identify deficient sections,” says Owen. Another benefit of ILP tools, he notes, is that they can help hospitals increase productivity. For example, improving TATs eases the stress for healthcare organizations that may be feeling the pinch from a shortage of coders and transcriptionists. ILP tools have a great deal of applicability, especially in HIM. “Speech recognition with ILP can prompt physicians if something is missing in a report, but speech recognition alone doesn’t add that value,” says Owen. • New concepts: According to Zavaliagkos, when severe acute respiratory syndrome (SARS) first appeared, interpretive models had no idea what it was, but after a few weeks of “observing” real-world data, not only could the models help the speech recognition get it right, but they also helped predict what the discussion surrounding SARS was about. • Specialties: eScription’s interpretive models have built-in context discovery. “As a result, we can interpret and structure disparate specialties and workflows such as radiology, neurology, mental health, etc, without the need to encode specific specialty knowledge to the application,” he says. • New applications: The component of the technology that recognizes document structure can be adapted to extract specific sections of documents. “EMRs are usually highly structured, requiring pick lists, for example, but physicians often prefer a more flexible structure that adapts to their workflow. ILP helps bridge the gap,” says Owen, who notes that clinical data within a hospital—80% of which are not structured—can be structured either by manual labor or ILP tools. Is ILP Taken for Granted? Speech recognition penetration and the use of ILP tools are relatively high in the healthcare industry compared with others, according to Mardini, but the technology still has a long way to go before it’s as common as the computer mouse. He says radiologists are probably the biggest users of ILP tools since their document processing is already electronic and the need to turn around documents quickly is such an integral part of the service they provide. Outside radiology, the motivation is there since documentation of patient data is mandatory, but not all healthcare facilities are using EMRs. — Laura Gater’s medical and business trade articles have been published in Healthcare Traveler, Radiology Today, Corrections Forum, Credit Union BUSINESS, and other national and online publications.